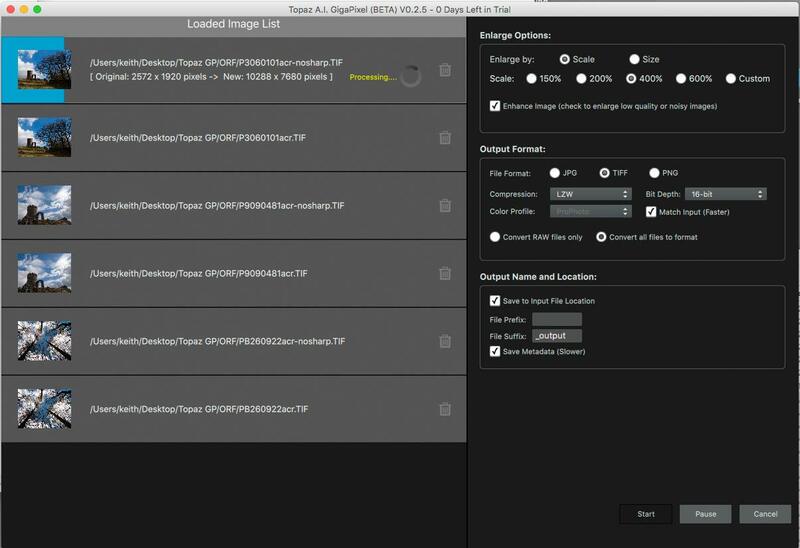 Topaz AI GigaPixels is a new standalone software package that lets you resize images either to a specific size or up to 600%. The full announcement info for Topaz AI Gigapixel is in a news article, but Keith was asked to have a look at a pre-release version, and has written up this short review. The Topaz info page has more examples and details. 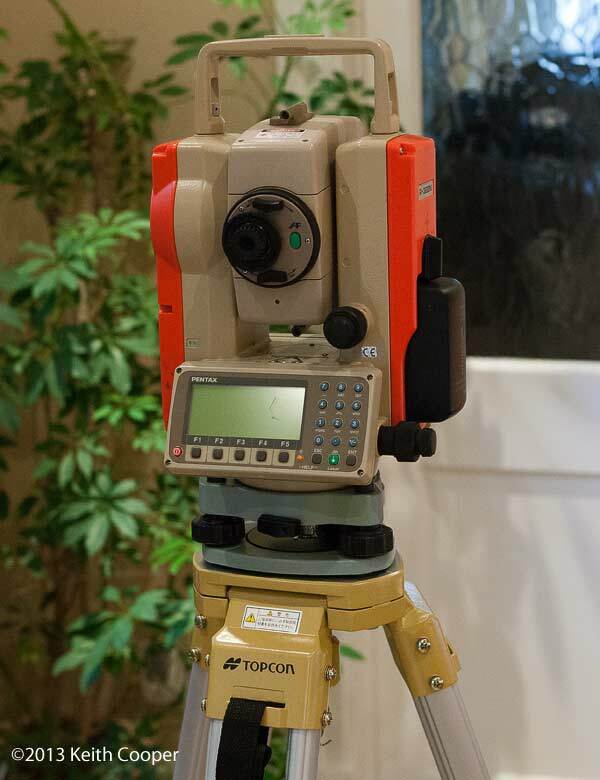 There have been several updates which improve speed, output quality and the software interface, but all you need to know about using the software is still covered here. Note: See update info at the foot of the article – mostly performance and UI tweaks, with better control over output quality. If like me you’ve been into digital image processing for a few years, then you’ll remember that image resizing/resampling used to be a hot topic of discussion. I can recall interminable forum arguments over the best way to resize your 8MP image to print at A3+ (13″ x 19″) or larger. As megapixel counts have risen and optical designs have advanced, the need for specialist resizing software has diminished. With images from my 50MP Canon 5Ds, creating larger (say 36″ x 24″) prints has become a lot more predictable. However, that’s not to say I don’t welcome an addition to my re-sizing toolbox, since I still get asked for prints from photos that I took with my 11MP Canon 1Ds and my 21MP Canon 1Ds mk3. The software is a stand-alone application, which I’m running on an oldish Mac Pro with 32GB of RAM and a modern 3GB graphics card using OS X 10.11. I mention this since the software is very resource intensive – with big files it will slow your machine down for a bit. Topaz A.I. 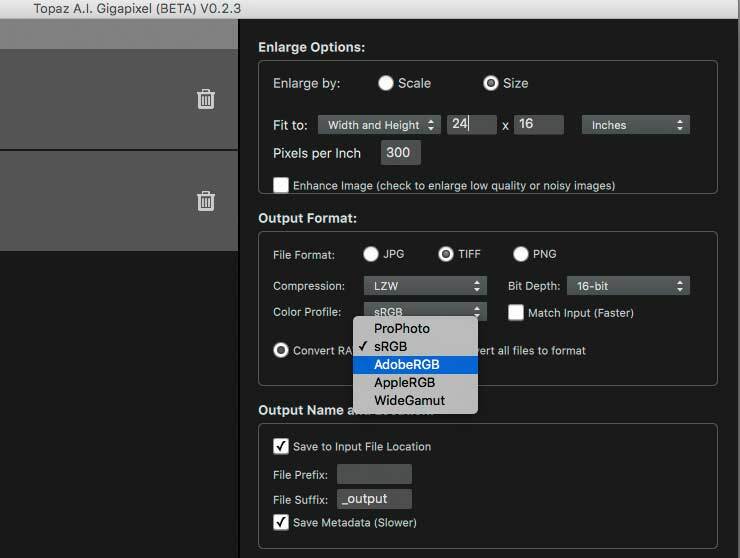 Gigapixel is available as a standalone batch processing application only. It is compatible with 64-bit Windows 7+ and Mac OS X 10.11+. It also requires a GPU with OpenGL 3.3 or later (Intel HD5000 or better, Nvidia GTX 760 or better, AMD R9 280 or better. I’ve long thought that some of the most useful software tools are ones that do only one job, but do it exceedingly well. 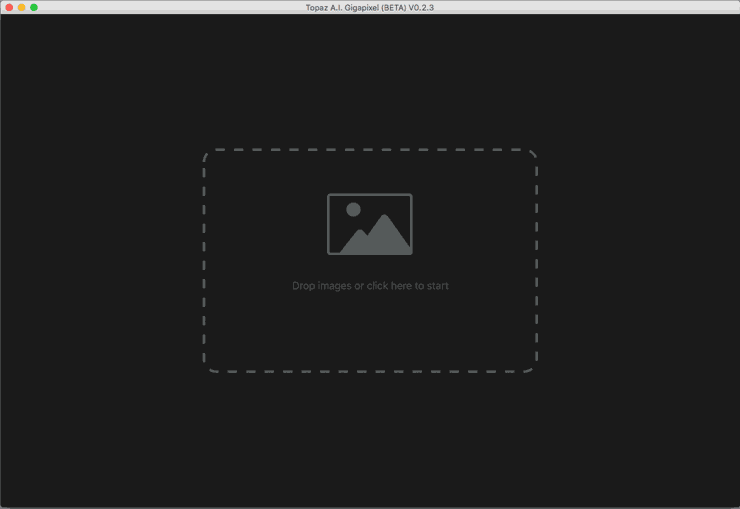 Topaz A.I GigaPixel shows this right from the start – it opens simply inviting me to drop files into a box. Loaded files appear on the left, whilst output options appear on the right. I can scale by a percentage. 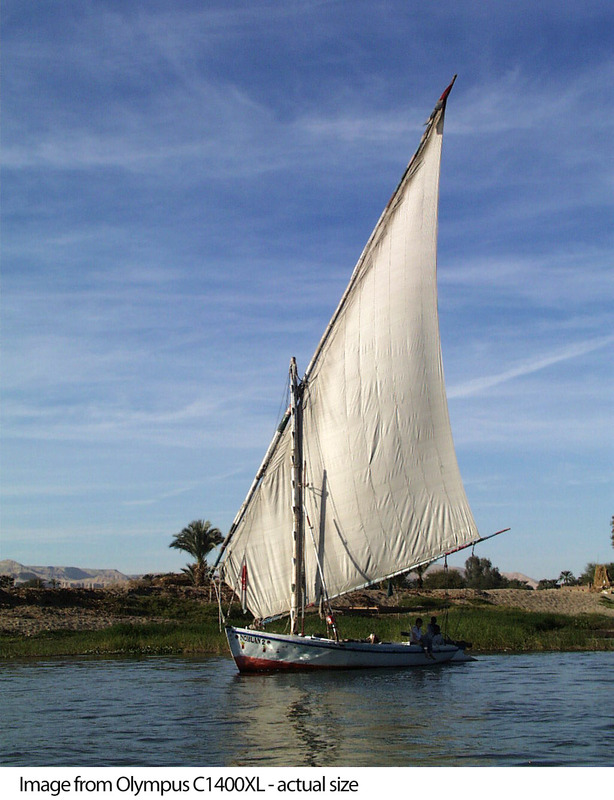 This is a linear scaling, so a 100x100px image will scale at 600% to a 600x600px image. The enhancement option adds a bit more secret sauce to the rescaling, so as to deal with noise and other image artefacts. I’ll show examples later, but like many of these things it depends on what the image looks like and what you are doing the resizing for (print or screen). 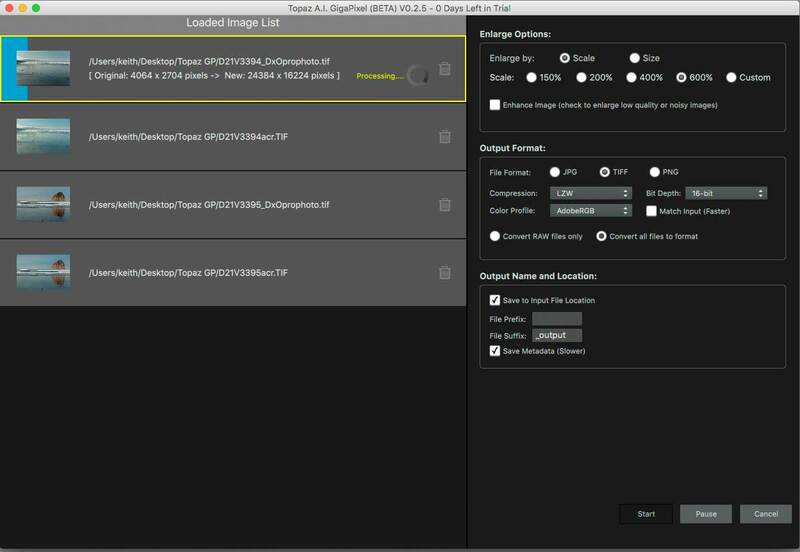 An alternative setting lets you set an actual output size and resolution. This output size can be in pixels or units of length. File output formats are currently JPEG, TIFF and PNG, and you can choose the output colour space. The software will process some camera RAW files, but I’d note that support for older cameras is variable, since it only saw the embedded preview files inside my old Canon 1Ds RAW files (they are .TIF). I decided to go straight for processing a couple of photos I took on a trip to the US Pacific NW in October 2004, where I had my 11MP Canon 1Ds with me. The software I’m testing currently has a 50,000 pixel maximum output size, which is pretty big. It’s nearly 14 feet wide if printed at 300 ppi. Even so, it meant I couldn’t apply a 600% resize to my 50MP 5Ds files. 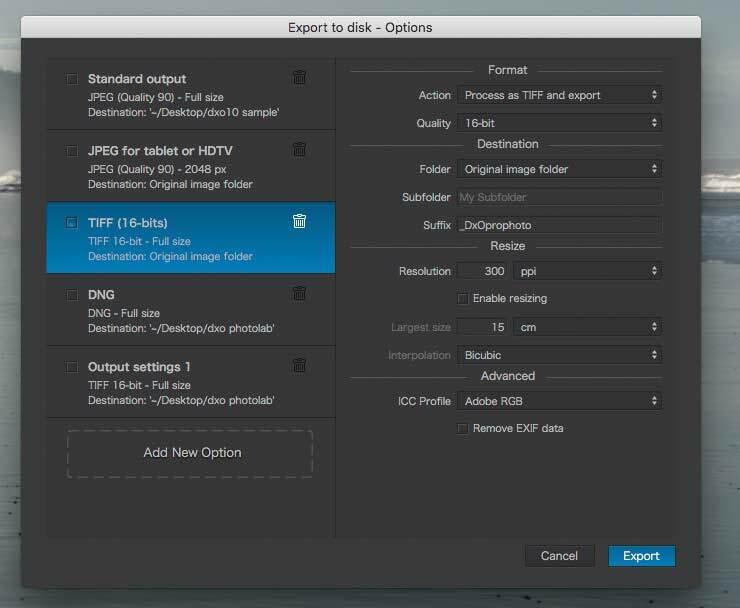 Other limitations come from a physical size limit for TIFF files, and the fact that if you select JPEG, then you’re limited to 30,000 pixels max. Topaz are aware of the limits and I’m told that this is an area that may be addressed in the future. I’d note that even my 16 bit ~24k x 16k pixel results from my 1Ds files killed several plugins I looked at to further process the images for printing. 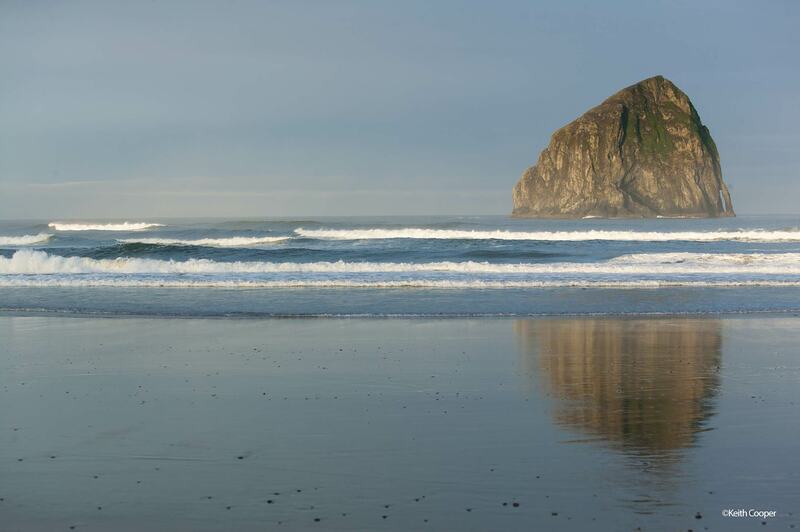 The two photos [click to enlarge] were taken early one morning at Cape Kiwanda on the Oregon coast. The sun has not long risen over the coastal mountains inland. Both are shot with my EF70-200mm F2,8L IS lens – the exact same one I recently used for all the aerial shots with my 5Ds when on a helicopter trip over my home city of Leicester. 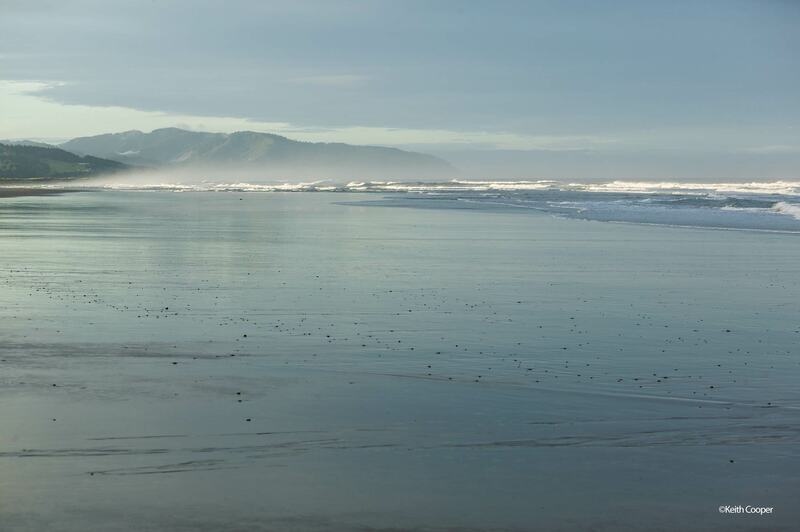 Looking out to Haystack Rock, and along the beach towards Pacific City, Oregon. 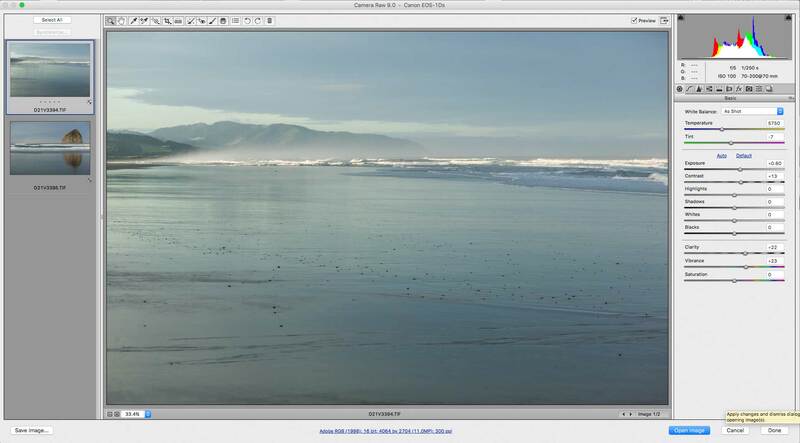 Knowing from previous resizing tests that results are critically dependent on how you handle your RAW files, I converted each image with Adobe Camera Raw (CS6) and DxO PhotoLab V1 (review -the replacement for DxO Optics Pro). 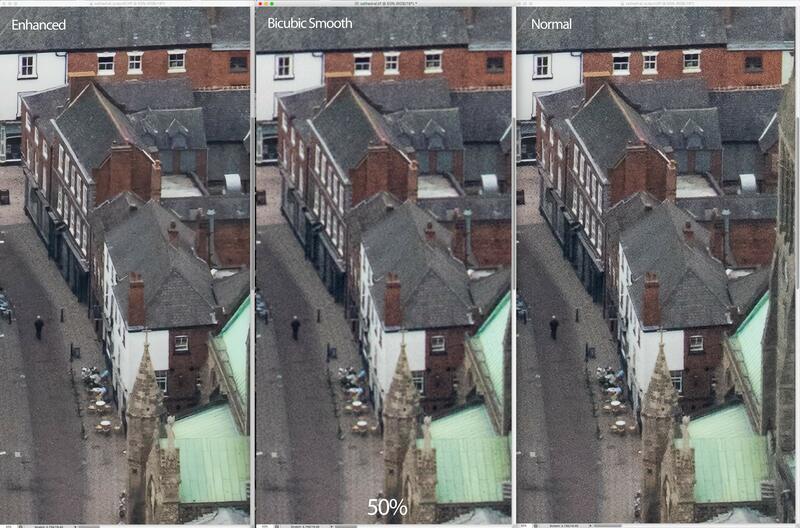 With both packages I’ve adjusted lighting/colour etc but have turned off any sharpening or geometry correction. I’ve used a small amount of vignetting correction. If you’re curious about other resizing experiments and large prints I’ve made, there is an article covering in depth how I created a 3m x 2m print from an 11MP 1Ds file and a detailed print based comparison of the 1Ds/1Ds3/5Ds (11/21/50MP) where I look at how much difference all those MP make at different print sizes. With PhotoLab I’ve just added a bit of smart lighting, a small amount of ‘clearview’ and turned off detailed lens sharpness corrections. As you can see, I’ve set it to save the image in Adobe98. Colour space choice is not so important in these relatively unsaturated images – it might be in other images (see ‘Printing red flowers‘ for more). On my oldish Mac Pro, each image took around 9 minutes to process. I’m scaling from 4064 x 2704 pixels to 24384 x 16224 pixels. Time passes and I now have 4 TIFF files, each around 2GB in size. That’s a very important thing to note, so if you really don’t like something I’ve done, then get the 30 day demo of the software from Topaz, and try it on a range of your own images – and if you’re doing it for printing, actually print them. The three images show a 600% increase, two with Topaz AI GigaPixel and the middle one just with Photoshop’s Bicubic Smoother. The difference between RAW converters is there, but without a lot of testing I wouldn’t want to call one any better than the other. Indeed I’ve used DxO Optics Pro (and now PhotoLab) for many years when making large prints, especially black and white, because it sometimes does make a difference..
I’ve produced some 16″ x 24″ prints from my files using a glossy Innova paper on an Epson P5000 17″ printer [review]. Some of you may well observe that my resized prints are near to 1000 ppi – way over the top for printing. I did print some cropped samples at 360 ppi and differences were more noticeable, but still at the level where I might need to check what’s written on the back of the print. 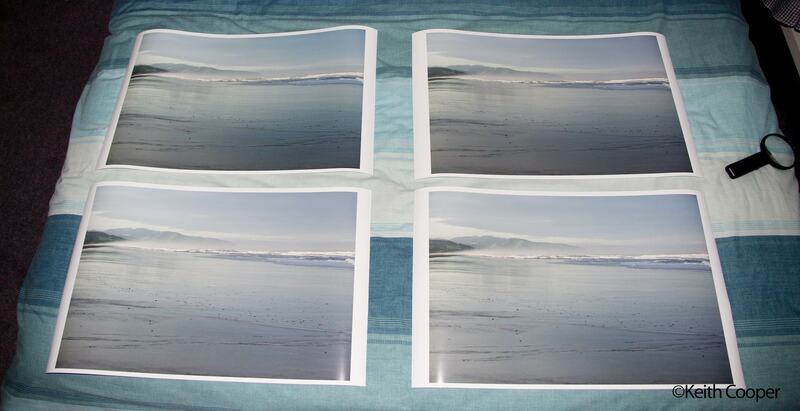 Here are 4 of the prints. At normal viewing distances, the variations are not easy to see. Any print needs a degree of sharpening before printing. I’ve used Nik Sharpener Pro (now part of the DxO Nik collection – review) for many years and am quite experienced in judging the settings for any particular print. One print shows the slight difference from processing with DxO (slightly different tone), but at this level of scaling the differences don’t leap out at you. Then again, they shouldn’t, since that would suggest that more basic scaling produced bad results – it doesn’t. 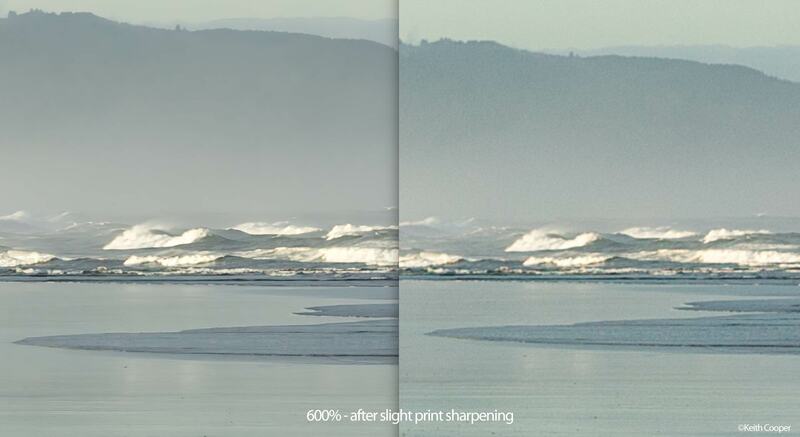 Let’s look at the images at 100% after resizing by 600% and applying a bit of print sharpening [click to enlarge]. 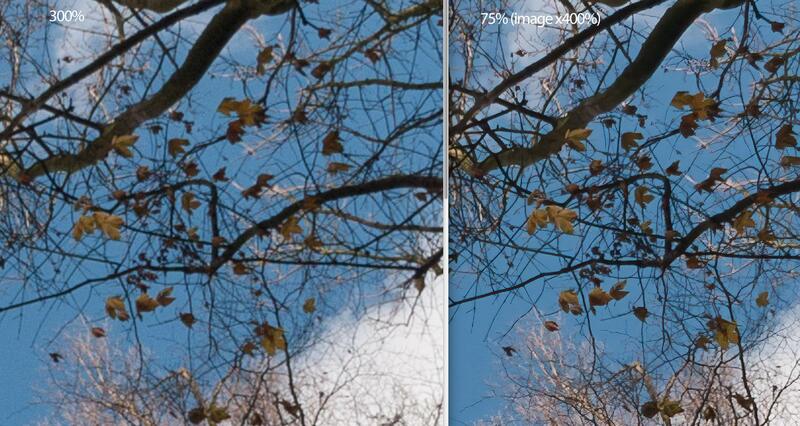 At the left is the version using Topaz AI GigaPixel and to the right after resizing with Photoshop’s Bicubic smooth. The two images are quite different – but remember this is for a print, so don’t get too stuck on any noise differences or other subtleties that would be lost in the print process. 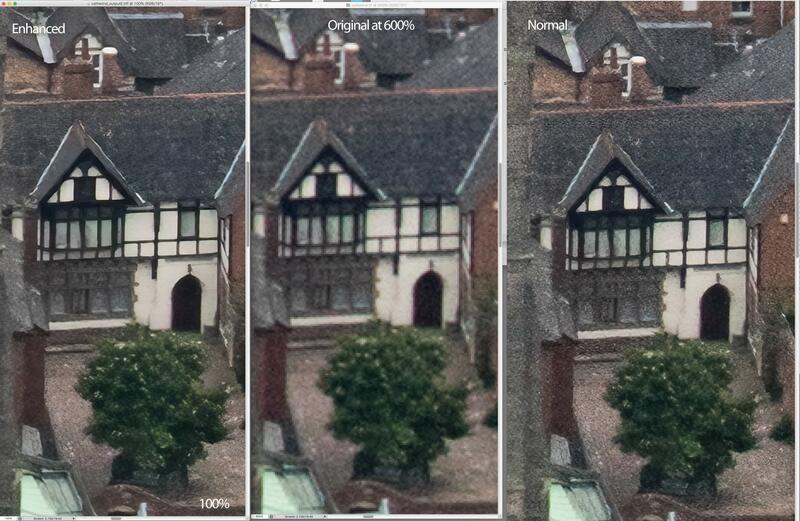 I mentioned the flight over my home city of Leicester in a helicopter, taking lots of 50MP photos – whilst the pre release version of the software I’m testing balks at 600% on a 50MP file, I wanted to see how it would handle the image detail. Resizing at 600 still takes a few minutes. I did the resampling twice – onece in normal and once in enhanced mode. The enhanced mode is good at picking out fine linear detail and removes a tendency for a fine noise pattern appearing in some areas. Once again, what’s best depends on what you want to do with the image. Just before I got my Canon 1Ds I tried out an Olympus E-20P, with the then excellent 4.9MP. It so happens that a few of the images are ones I’ve been asked for prints of, so I looked in the archives to find the original .ORF raw files. I processed the images in ACR with and without any sharpening. The resulting TIFF files were bumped up 400% – more than enough for 16″ x 22″ prints. It wasn’t until I opened an original file at 100% and it easily fitted on the screen of my 4k 32″ monitor that I was reminded just how far we’ve come in 15 yrs. 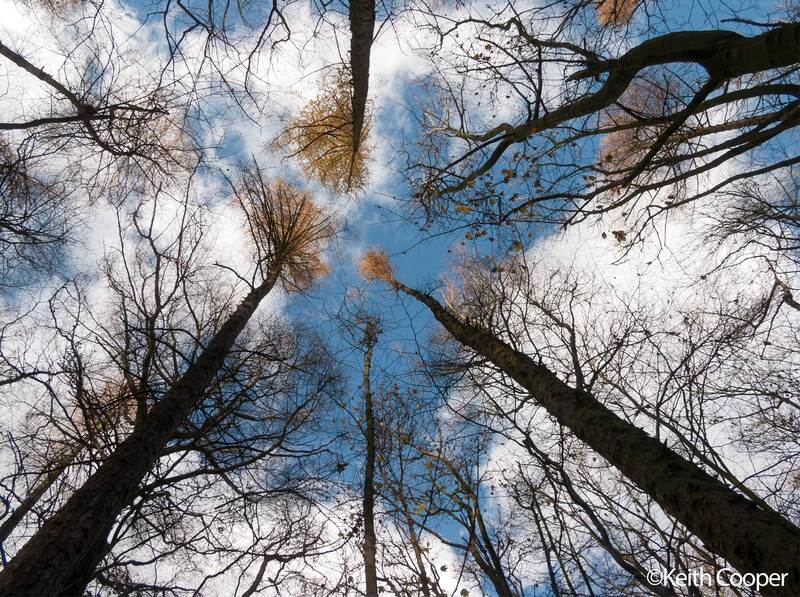 Here’s the photo – some trees in a local park. It’s impressive and easily visible on an A3+ (13″ x 19″) print. 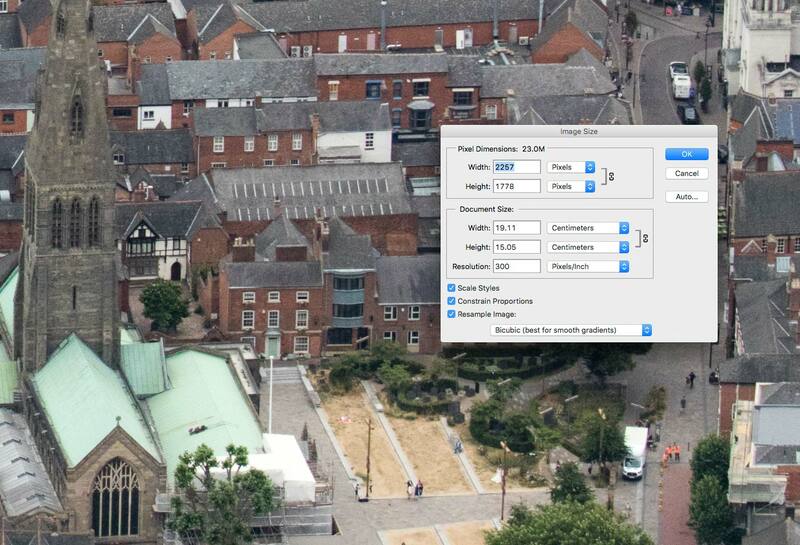 In looking at the image above you can see where the software is creating plausible detail as part of its upscaling. Take this image from a trip to Colorado (from my 11MP 1Ds) that I’ve used for making B&W prints. There’s a lot of very fine detail in those trees. Here’s an example of the original image enlarged (to show the actual pixels) and the result from AI Gigapixel after I’ve converted to black and white [click to enlarge]. Spend a while looking at the features in the snow and the trees on the skyline, and then look at the pixels they came from. This is far far more than simple re-sizing. Now, here’s a version at 400% enlargement – this is the full image so you may want to click to open in a new window or save to look at in an editor. One of my first observations was that a lot of JPEG compression artefacts had gone in the upscaled version. Not too bad for a 1.2MP camera. When updating some articles on the site recently I found that the only versions of the images I wanted were 600 pixels wide, rather than the 740px that is current. A simple 200% resize followed by reducing (bicubic) back to 740px wide gave a very clean image – much crisper than simply re-sizing the original. I don’t know how often I’m going to need this, but its a useful tool. I’d note that you could simply specify resizing to 740px, but the enlargement/reduction gave more punch to the image. After trying a few images from the Olympus E-20P I decided that some sharpening at the RAW processing stage (~20% in ACR) produced slightly better looking enlargements. For the 1Ds and the 5Ds a small amount (a few percent) seemed to add just a bit more definition at larger sizes. This is something you’d need to test for different cameras and lenses. Fixing chromatic aberration first made a clear improvement. For image use on the web at high magnification, you might want to add a tiny bit of noise to your resulting images, to reduce smooth ‘painted’ effects that some flat areas can give. Once again a bit of experimentation needed, since results are critically dependent on source material. 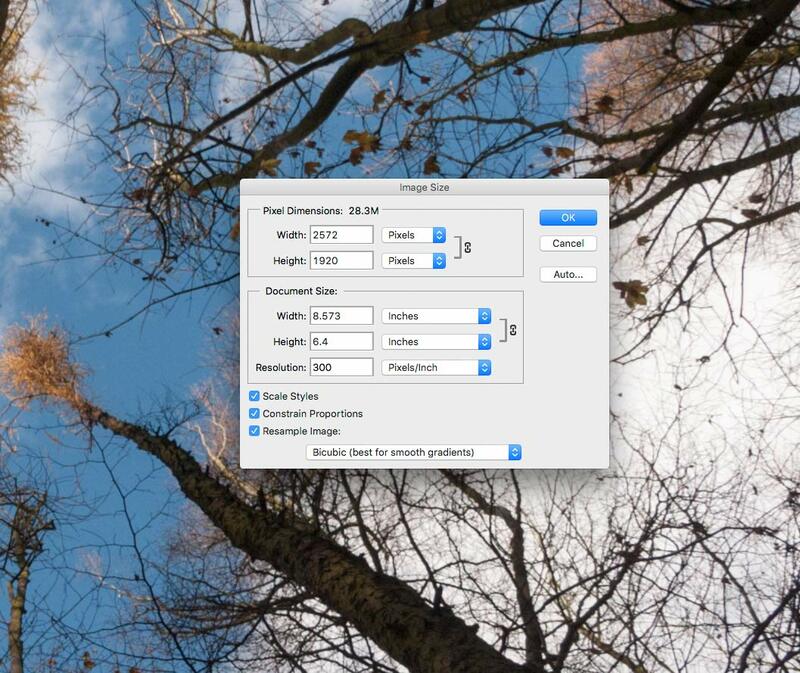 If you regularly resize images, it’s well worth a try. Note, if you buy the software after downloading via our link, we get a small commission – no cheaper I’m afraid, but it helps run the site. See all my other Topaz reviews in the Topaz article index. 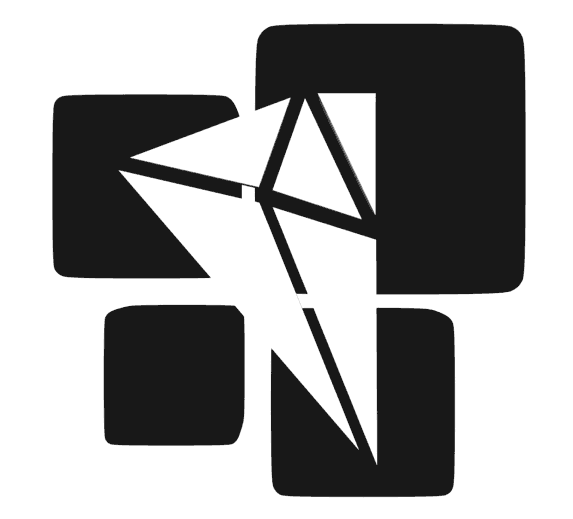 Topaz also have a ‘making of’ blog post covering some of the background development info for the software. 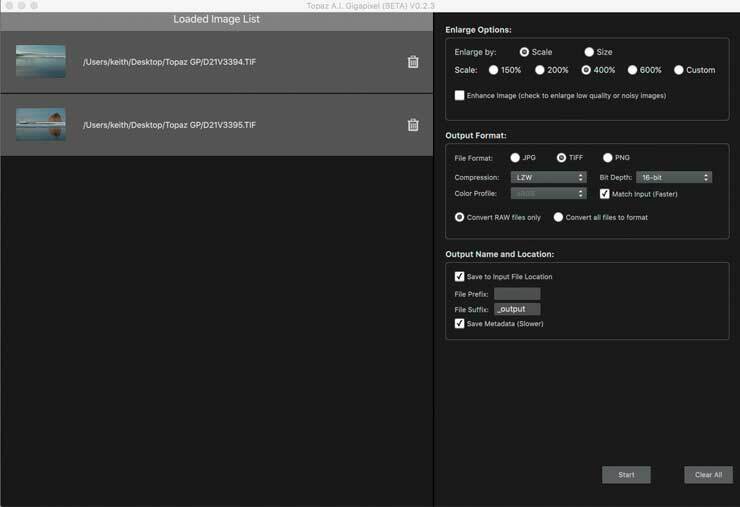 Topaz AI Gigapixel V1.1 update info adds CPU only processing and settings for source image noise/detail levels (free update from within software). A short update article shows Topaz AI GigaPixel V3, where interface design is clearer and there are some improvements in performance. 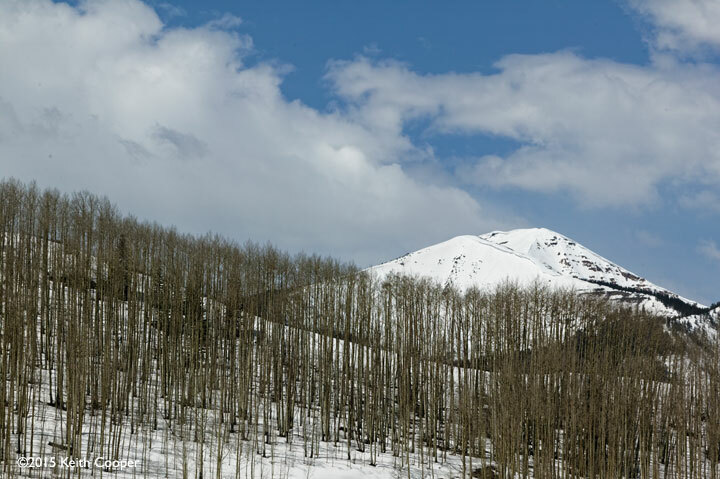 Since being launched, Gigapixel has become one of my key tools for making big prints – see my article about Making big prints from low megapixel images for examples.